You don’t have to redo your entire house to embraces what’s trending in interior décor for 2019. According to the latest style prognosticators, a few dominating décor trends emerging this year are easy to incorporate as doable additions. When it comes to interior design, opinions are like noses, everybody’s got one. And sometimes they’re as different and as individual as the person themselves. But after scouring design magazines, designer websites, and interior design journalists, we found a few recurring elements and themes bubbling to the surface. According to the designers at Décoraid, rose gold was one of last year’s most used (and over-used) décor trends of 2018. In 2019, expect to see less rose gold and a more dramatic metal: copper. This trend is a movement to embrace elements that are naturally occurring in, or sprouting from, the earth. These elements are easy to layer into your home as accent looks and pieces. 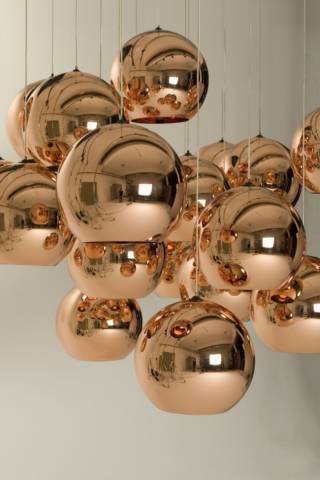 Look at House Beautiful’s gallery of stylish copper accessories you can copy for your own – from a magazine rack in your bedroom or office or copper light fixtures like eye-popping pendant lights by Tom Dixon, to copper pots. Overstock’s collection of artwork and accessories includes copper embossed trays and wall hangings with just enough of the gleaming metal to bring a little bit of trendiness into a room. And for even more ideas and inspiration, check out the many ways Pinterest found to glam up your home décor with copper accents. This trend started in 2018 and has carried over to 2019 and it’s apparent in velvet furnishings like sofas and soft chairs, and even velvet bedding. Remember 20 years back when velvet was so “dope”? Well, it’s back – and exponentially. LivForInteriors says online searches for velvet have skyrocketed and the fabric continues to be a top interior trend for upholstered furniture. A simple way to add velvet to your life is a classic or crushed duvet cover in the bedroom. Williams-Sonoma and Pottery Barn at Park Meadows in Lone Tree, and Bed Bath and Beyond, a bit further down Yosemite carry a wide variety of choices. Those connections that people want to nature is one reason why wood is finding its way into unexpected places in the home. And why not? The beauty of wood is undeniable – as is its warmth and endurability. Whether in trim and accents or as a unifying look to pull a room — or rooms — together, natural wood is slowly overtaking cold white kitchens that have been popular recently. Wood surfaces give kitchens a more relaxed feel. And kitchens aren’t the only place you’re going to see more wood. The natural substance adds a pleasant aesthetic to any room in the house, whether it’s a piece of furniture you’ve fallen in love with, a natural hardwood floor or even a wall covering. If this is new terminology for you, you’re not alone. This is the year of the craftsperson, and we’ve seen that opinion more than once from the pros who make their living redesigning home interiors. Whether it’s a handcrafted headboard, pendant lights that look detail-obsessed, or a custom mantel or metal-framed mirror, a few artisanal elements will keep things interesting. It’s part of a trend to escape cookie-cutter sameness and now you can find anything from a standout table or chair to stunning glass sinks like these works-of-art from artistic vendor Brock Madison Glass! Another Trend in 2019: New Homes! Your home says as much about you as your checkbook or Facebook favorites and in the master-planned community of Crystal Valley – the styles are as varied as they are inviting! Explore all the options in the nine amazing models from D.R. Horton, Kauffman Homes and Richmond American Homes and find out why our community is among the top five fastest-growing in the state with new homes priced from the $300s.